Every Spring we all rush out to the plot and frantically dig for victory in an attempt to get those potatoes and other early crops in. But beware, after a harsh winter, if you haven’t been doing much exercise you can easily do your back some damage. Warm up before starting to garden by gently stretching your muscles. If it’s cold, wait until later in the day when it’s warmer. Take regular breaks and drink plenty of liquid. 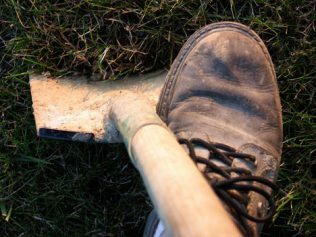 So if you have lots of digging to do, try and do a little at a time or do a bit of digging and then do another job, or have a break and go back to the digging later. Don’t lift heavy objects. If you must lift something, remember to bend your knees and keep your back straight. Use a wheelbarrow to move objects where possible. Wear belts that support your back if necessary. Also, on RoedaleValley recently a little girl had a very nasty eye accident recently because of a bamboo cane. PLEASE cover them with something or remove them if they are not being used. Safe Gardening. A Amos, Site Rep, RoedaleValley.